Hog Roast Peebles has just one goal – to provide you with fantastic food that will impress your guests, and send them home happy and full. We achieve this by only using the best quality, locally sourced ingredients. 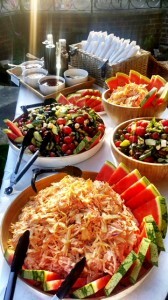 Our team of professional caterers has plenty of experience. Over the years, we have provided the food for literally hundreds of private parties and corporate events, so you know we have the necessary experience to provide you with a fantastic service. For any party or event, a hog roast is a great option. The sight of a whole spitting pig turning on a spit is one that people love. It adds a touch of theatre and creates a great ambience. However, at Hog Roast Peebles, we know that not everyone can eat pork, so we also provide you with the chance to enjoy spit roasted turkey, chickens, beef or lamb instead of a whole roasted hog. In addition, we provide an extensive range of tasty side dishes. Again, every taste is catered for. If you have guests with special dietary needs, we have you covered. Our range of canapés, steamed seasonal vegetables, potato options, salads and desserts provide plenty of choice. All of the food we cook is prepared by a team of experienced and fully qualified catering staff. Every dish is made from the best ingredients and freshly prepared on the day. The food we provided can be served in a variety of ways. Therefore, whether you are planning an informal buffet or a formal sit down meal the Hog Roast Peebles team can help. We provide the appropriate plates and cutlery for your event as well as waiting staff if you need them. There is also the option to hire a hog-roasting machine from us and cook your own spit-roasted meats. We show you how to do it, and take care of cleaning the roaster when you are finished with it. If you want fantastic party food, all you need to do is to take a few minutes to fill out our quote form.